Ferrari of Austin knows how hard you worked to buy your car, so we want to ensure you're informed about all the risks that come with automobile ownership. You protect your car with insurance, and you lock your doors to prevent theft, but is your car rodent proof? Rats, mice and even squirrels are a problem. They make nests in the engine compartments of vehicles, and they love to chew on wires. If rodents chew on engine wires, they can cause serious damage. To prevent rodents from taking over your vehicle, keep the area around your car free from debris and food. 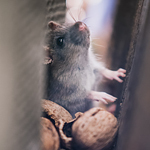 Seal any possible entrances to your garage, and keep an eye out for rat droppings and shredded paper. If you see signs of rodents, call an exterminator. You can also use a spicy solution to rodent problems. Find electrical tape coated in capsaicin to stop rodents from chewing on wires. Rodent deterrent tape is a humane way to rid yourself of unwanted pests!